Political Science is offered through the Division of Behavioral and Social Sciences in the College of Humanities and Social Sciences. The program offers high quality upper division courses and advisement designed to prepare students for a wide variety of careers related to Political Science and International Relations, as well as providing graduates with a solid foundation for postgraduate study. These courses acquaint students with major areas of knowledge and help students develop many significant skills needed for academic and career success. These courses help students as they embark on the journey of integrating their personal Christian faith with their growing base of academic knowledge and awareness of the world around them. 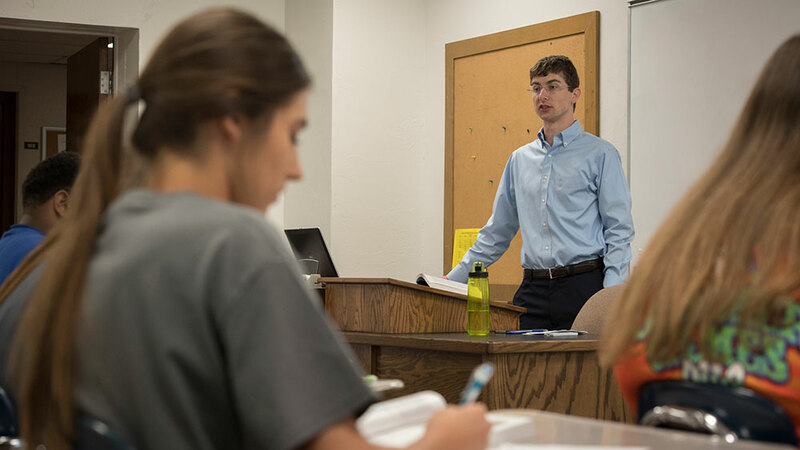 What makes an OBU Political Science degree special? Our program places a distinctive emphasis on the intersection between Christian faith and political life. Faith informs every aspect of a Christian’s participation in the political realm. Answering a vocational call in fields related to politics and law requires a comprehensive understanding both of political and legal processes and of one’s own core beliefs. We offer a full education in the academic discipline of political science, enhanced by an emphasis on this important interaction. What are OBU grads doing with their Political Science degrees? Grads have attended any number of law schools, including Washington and Lee, Vanderbilt, OU, Baylor, Texas Tech University School of Law and the University of Tulsa College of Law. If academics is not your goal, our graduates go on to work in international settings, the FBI and the Peace Corps. If elected politics is your goal, many of our graduates have worked in the White House, the Pentagon and various state legislative settings. Several students currently work in law firms throughout Oklahoma.